Create Custom jewelry just like my Award Winning Studio. GIRL'S! You are the jewelrydesigner! 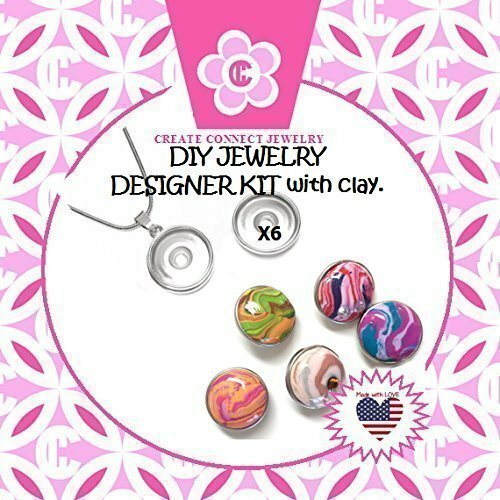 With the Holly Girl's Jewelry Designer Studio color box you create 6 custom snap charms with CC3 oven bake Jewelry Clay. PARENTS! Has your child ever received a DIY jewelry kit that was so complicated, or had so many components that YOU actually did it YOURSELF? That does not build creative confidence! I assure you that not only can your child complete the jewelry in this kit BY HERSELF, but you both will BE AMAZED by the results! My DIY Jewelry kits help build creative confidence in Women and girls. The proprietary jewelry pieces allow you to create jewelry directly into jewelry bases that form a permanent bond when cured in your home oven! Snap Pendant with Stainless Steel Chain. Ages 8 and up. All products are non-toxic and safe for home use. You will need an oven to bake the jewelry at 250 degrees.for 30 minutes. If you have any questions about this product by Create Connect Studio, contact us by completing and submitting the form below. If you are looking for a specif part number, please include it with your message.